I am sure we have all witnessed the exponential increase in the number of local clothing designers in Kenya. Actually, thinking about that, let me rephrase. I am not sure if the number of local designers has been on the rise (highly probable) but Kenyans have an increased interest in them. For a long time, ‘mtumba’ (second-hand clothing) has ruled Nairobi’s (and Kenya’s) fashion streets. For a number of reasons; topping the list is that mtumba clothing is affordable and unique. But in the past 2 years or so, Kenyans are increasingly getting clothes designed for them both by their ordinary ‘fundi wa nguo’ (tailor) and well established local designers like Kaveke, Sylvia Owori, Patricia Mbela et al. 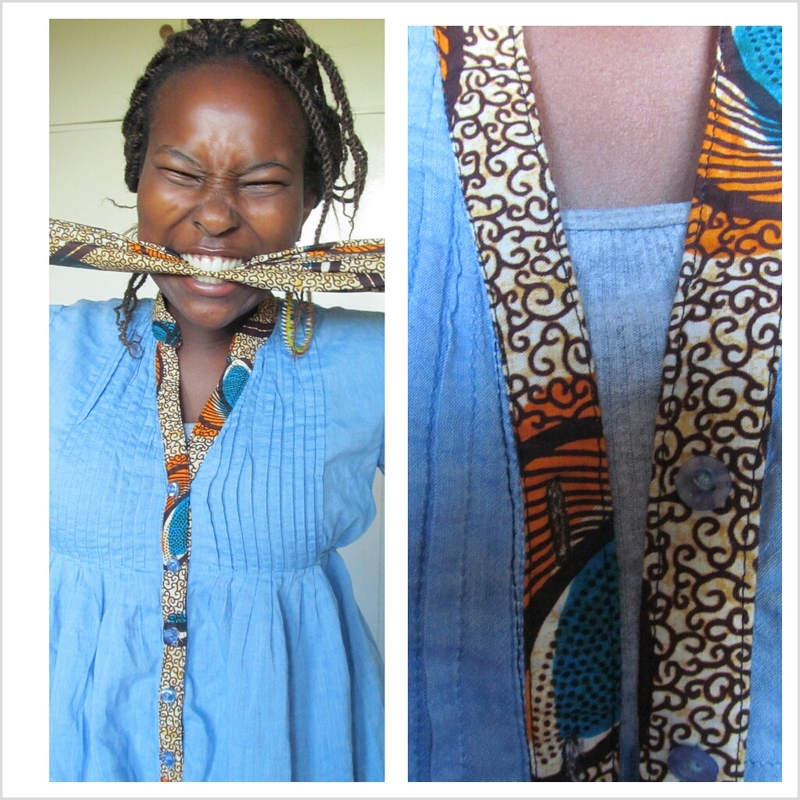 And more recently, there has been a Kitenge trend going around. Previously, I thought of Kitenge as old-fashioned and for my mother’s generation (no offence if you’re reading this mum). I now think Kitenge is cool. Let’s face it, we young people cannot afford a Kaveke dress. But thanks to affordable online stores like Nairobi Closet, with every order we place, we get closer and closer to feeling like we have been dressed by the best. I stumbled upon the Nairobi Closet facebook page by chance. You know, a few facebook friends had liked their page, this appeared on my homepage, I was like ‘ah, lemme check it out’… *fast forward* I ended up with two beautiful items of clothing. YAY! 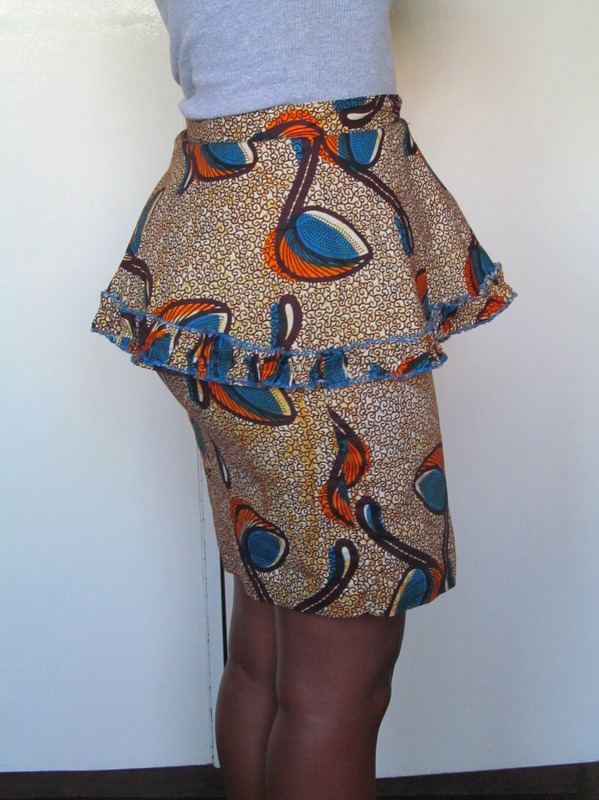 Nairobi Closet kitenge peplum skirt. 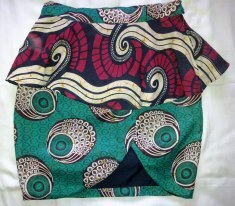 This beauty is a dual-print high-waist kitenge peplum mini skirt. What’s there not to love about it? I wanted it immediately! My mum has lots of kitenge wear. And she has the most beautiful prints. I saw the skirt above and *light bulb moment* ran to scavenge for all the left over material from her own dresses. She gave me these 3 remnant fabrics. 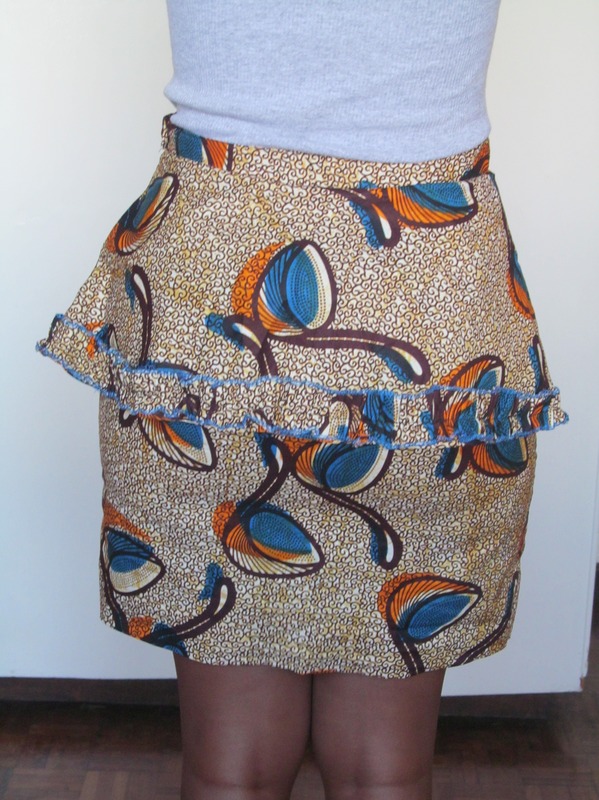 I decided to order the skirt and have it done with my own material. I had it changed up a bit. 1. I wanted it in one print, my own material. 2. I felt that the peplum detail would not come out as boldly as it would in dual-print so I asked to have a frill at the border. 3. I also asked to have it made 2 inches longer than it usually is. 4. I covered up the slit because when I wore it it was indecently high and very exposing. I paid only KES 700 for the skirt because I used my own fabric. 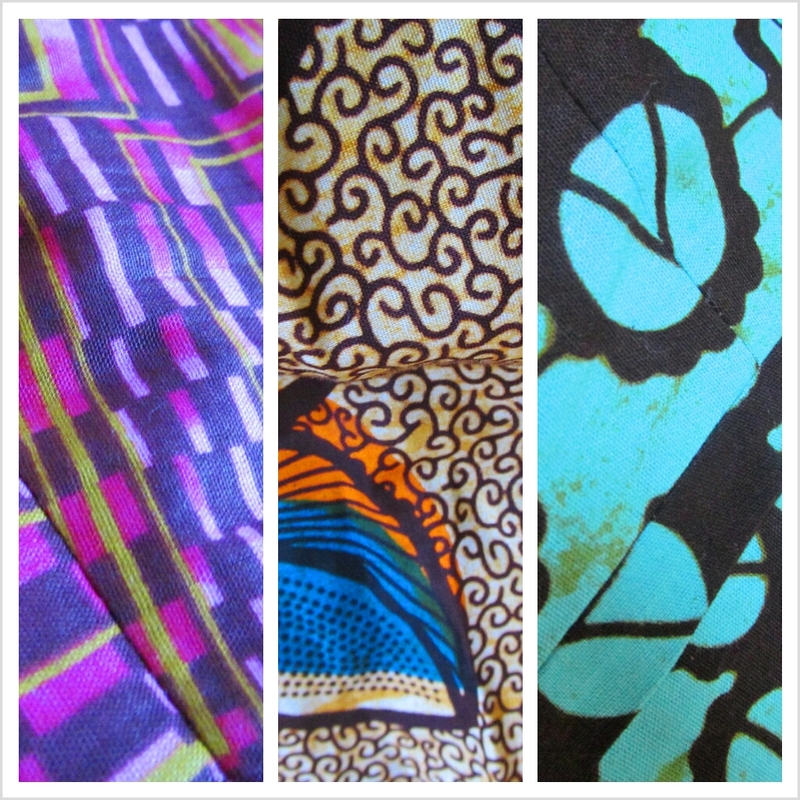 However, Nairobi Closet has a variety of fabrics to choose from. 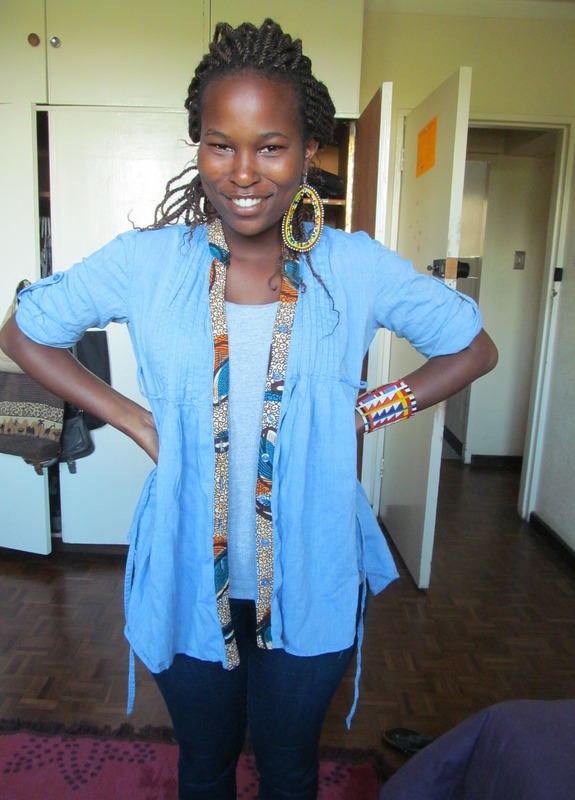 I had kitenge detail added to a denim shirt I owned. Here’s how it turned out. I LOVE IT! I wore it on campus two days ago and was showered with compliments. It was really cheap to have done. ONLY KES 300! 10 points for affordability. 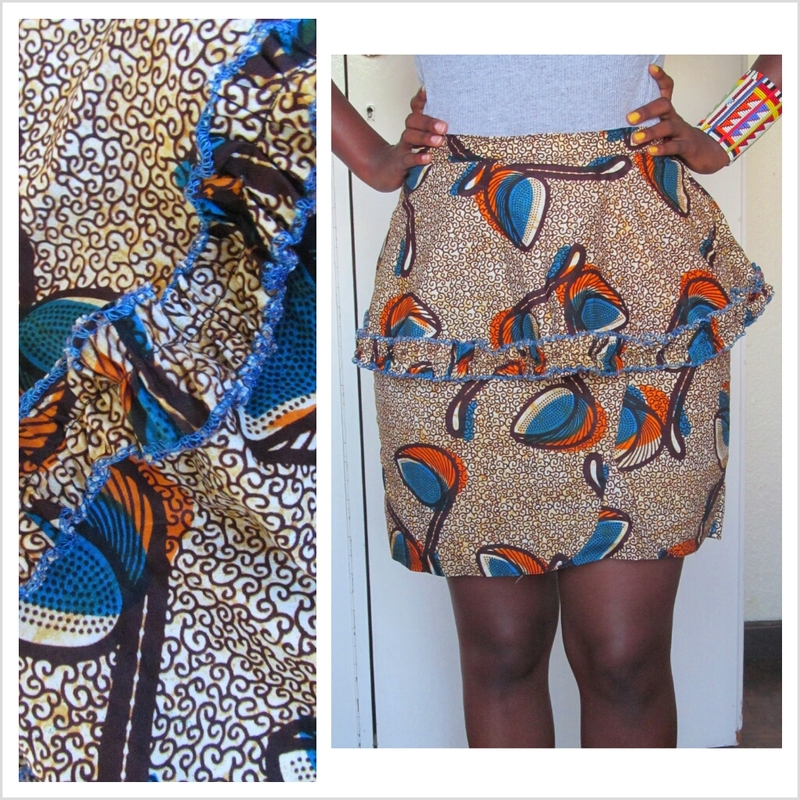 Please visit the Nairobi Closet facebook page for details on how you can place your order. Kitenge Kulture part two coming up where I share some other two items of clothing I had done by a different designer and tailor. 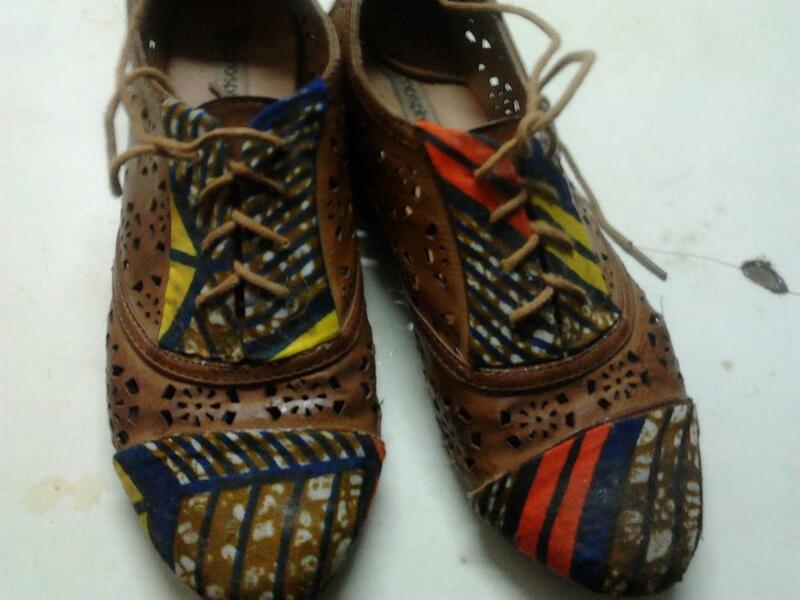 Where can I find those kitenge brogues. Love them! Hey. The shop is no longer operational. so sorry about that! I have to say it is a trend I am enjoying thoroughly. I have this fabric that I haven’t used yet, because I can’t make up my mind on what I want. That peplum skirt is hot though!!! How come the other partners aren’t mentioned? Sorry, what partners? Nairobi Closet? Unfortunately at the time I was writing this post I had only met Janet for a short 10 minutes and didn’t get specifics. thank you! :)) I love it! Nelly!! si you’ve outdone ourself?!! The upgrade is timam sana na tena sana! Some sections of the text are a bit hard to read though, due to the background colour effects.. but all in all, very nice! LOL! the 9th commandment (I think) 😛 Asante mammi!